Clay is a rock or soil material made up of aluminum and iron silicates, magnesium, calcium, copper, sodium, potassium, manganese and crystallized into very fine particles. Clay is one of the primordial materials used by men since the dawn of time to build shelters, to craft utensils and garments, and to heal. Purify your skin once each week for maximum health and beauty. You’ll love the subtle tingle as you feel the mask cleansing your skin of environmental impurities and other cosmetic residue. Clay acts as a safe and gentle alternative to harsh exfoliation treatments like peels, acids and enzymes. With the intelligence of nature, it absorbs dead skin cells, but leaves the living — all without damaging its protective hydrolipid barrier. Use weekly for its transformative benefits. As needed, it is a wonderful spot-treatment for blemishes. 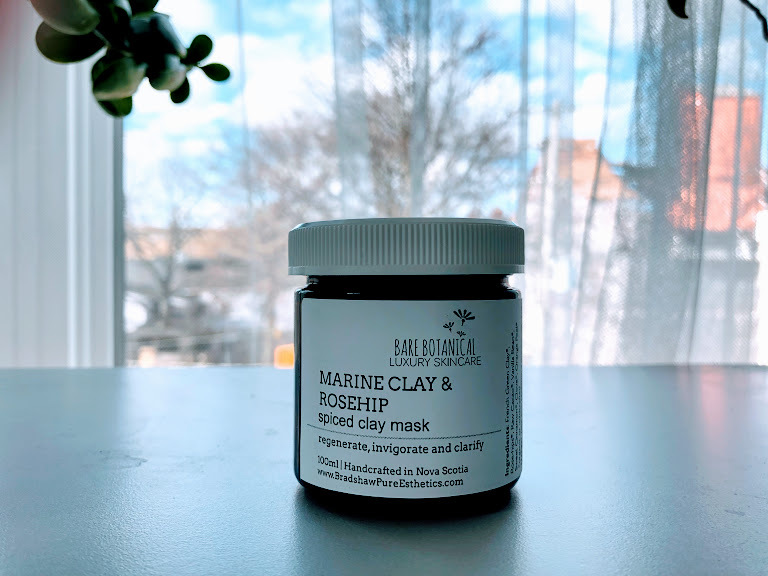 Marine Green Clay - It comes from a quarry located in the extreme south of Sicily, in a clean area that is sunny and breezy all year round. The clay is excavated and dried during the summer months. Being of marine origin, our clay is very rich in mineral salts and trace elements, which contribute to make the clay particularly active. It contains bivalent iron; a younger and more effective iron that gives clay a colour that ranges from green to blue. The presence of Silica helps slow down the ageing process, making our Clay an exceptional natural anti-ageing agent. Rosehip Fruit has a unique chemical make-up that includes high Vitamin C content as well as Vitamin E and Vitamin A, making the fruit an excellent brightener. It has been used for centuries and studied at length for its ability to reduce the appearance of scars, repair deep cellular damage, and minimize the appearance of fine lines by supporting collagen and connective tissue. Ours is wild forged right here in Nova Scotia by us. Clove – bring not only a beautiful wintertime nostalgia to this luxurious mask, but they also stimulate circulation and bring new nutrients and vibrancy to the skin. Orange peel - brightening, gently exfoliating. Raw cacao - antioxidant-rich, raw, and deliciously intoxicating. Cacao elevates the masking experience to being an absolute treat for the senses. This weekly indulgence of skin-brightening spices encourage blood flow to the surface of the skin, a massive dose of minerals, and antioxidant-rich superfoods. Can be used as an exfoliating cleanser, which is a wonderful option when time does not allow for the lengthier mask experience. Simply add a small amount of dry powder to your hand with an equal amount of water, with a gentle touch massage onto face taking your time to stimulate blood flow and release dead skin cells. Leave on for one minute and then rinse away as you would a normal cleanser.